Situated between the Sierra de los Filabres in the north and the Sierra de Alhamilla in the south east, an exhilarating and overwhelming sight to behold. An area of badlands, this natural desert landscape is a geological marvel that has been millions of year in the making. This place is awesome, you really have to see it to believe it. A must do destination in Almeria. 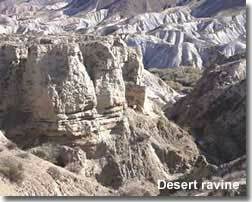 This area was actually, at one time, covered by the ocean, until the Sierra Alhamilla mountain range, thrust upwards isolating the Tabernas area from the sea. An inland saltwater lake was created, which, diminishing over time, left the original seabed and remaining mineral deposits exposed and open to the elements. The end result of the sedimentation, or settling process, being a terrain consisting of calcium carbonate, mudstone and sandstone, highly susceptible to erosion. Over time weather conditions and environmental circumstances have created this astounding and unusual territory. Today, the parched landscape receives a considerably high concentration of sun exposure per year, with summer temperatures constantly exceeding forty degrees. The rainfall is infrequent yet torrential when it occurs, often creating seasonal flash floods in the normally dry river beds, these downpours have carved out the dramatic trenches and tubular holes that give the desert its unusual moon like effect. Although the environment is quite inhospitable there are in fact some species of animals and reptiles, mainly rabbits, rodents, lizards and snakes, that thrive here. The desert is an Area of Special Protection for the wide variety of birds that have found their shelter in the ravines, species to be spotted include Bee-eaters, Warblers, Crag martins, the Trumpeter finch and Dupont's lark. Birds of prey, such as the Peregrine Falcon and Bonelli's Eagle, from the Sierra Alhamilla mountain range use the desert as their hunting territory. Situated on the edge of a deep ravine at the foot of the Alhamilla mountain range, Tabernas village was originally a place for Roman troops to stop and rest during military campaigns, a tradition which continued through the centuries and civilisations that followed, many taverns were built in the area to welcome visitors, thus giving Tabernas its name. Not much has changed, still enticing visitors, Tabernas village is a place to unwind and enjoy warm Spanish hospitality in a destination central to many of Almerias attractions. 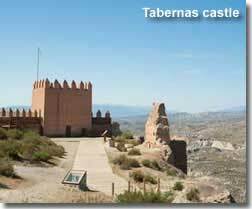 Tabernas castle sits on a hilltop above the village, dating back to the 11th century and of Nazari style it is now a site of cultural interest, though mostly in ruins the castle can be visited to appreciate the panoramic views. Local folklore decrees it was here that the last Moorish king surrendered to the Catholic kings, Fernando and Isobel, in 1489. 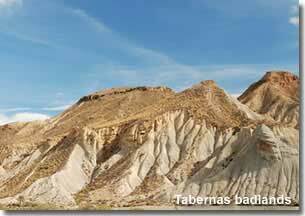 Tabernas village is easily accessible from the main N-340a and only a thirty minute drive from Almeria airport. Taking advantage of the sunshine, Tabernas is also home to the largest European solar energy plant, the Solar Platform of Almeria. 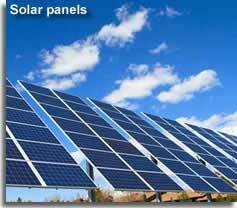 A place dedicated to the scientific research of renewable solar energy, and its development as a source of energy in todays world and for the future. A project they are very proud of, its rows upon rows of futuristic looking sun seeking mirrors makes an unusual sight to see and can hardly be missed if driving on the A-349 from Tabernas towards Senes, the centre is signposted from the main N-340a. The Solar Platform has a visitors centre offering guided visits which are available in English if pre booked in advanced. Provided to help visitors make the most of the area. The link will open in a separate page. The Solar Platform of Almeria, for further information on Almerias solar energy plant and guided visit options, the website is available in English. 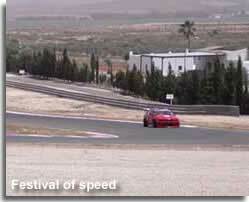 The Almeria racing circuit is situated beside the N-340a highway a few kilometres from Tabernas village. This fast and exhilarating circuit welcomes both cars and bikes, the 4.2km track is well laid out with 14 corners and a straight run of 900m, the circuit also places much emphasis on safety with large run off areas. The viewing area, situated above the pits, extends to over 200 metres making it possible to see almost the entire circuit give or take a corner or two. Away from the pit area the onsite bar and restaurant also provides generous views of the course. 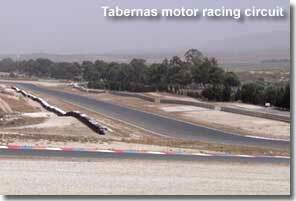 In 2012 the Tabernas racing track was host to the first ever Almeria Festival of Speed, held on 29th June with the aim of popularising Almeria as a destination for motor racing enthusiasts. The huge paddock area outside of the pit was used to host displays of classic sports and racing cars with general entertainment including performances from local bands and musicians. The festival welcomed and encouraged all types of car or bike to attract people who would not normally consider entering a track event, the contestants participating for the Almeria Speed Trophy 2012. Entry forms and particulars were available from Spectrum fm radio station prior to the day. Spectrum fm reported that at midday the event had over 2,000 people in attendance, fantastic, however by mid afternoon, about the same time that I arrived on location, a Sirocco wind from the Sahara desert of North Africa brought a near sandstorm to the track as well as temperatures of over 45 degrees which did play havoc with the cars and the crowds. Tabernas is famed for its award winning Olive oil, the desert climate conditions make for an exceptional environment for the tree to thrive and produce a top class yield particularly as temperatures remain stable during the whole olive growing and ripening period. The olive tree has been in existence for a few thousand years and been know by many civilisations yet it was the Egyptians that first produced an oil using methods similar in nature to the process used in Almeria up to only a few decades ago, though production techniques have since improved with advancements in technology. 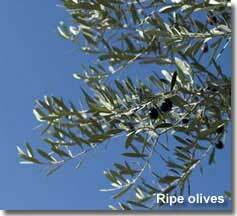 The Arabs can be thanked for introducing the olive tree to the Iberian peninsular, and today there are two first class olive farms situated in Tabernas both making their own quality product. El Oro del Desierto, translates as gold of the desert, and is the brand name for the range of olive oil produced by this family run farm and business. With 25,000 olive trees they pride themselves on their organic extra virgin olive oil farmed using an ecologically friendly system that only uses natural resources. The fruit is harvested by hand and cold pressed within eight hours. The milling and bottling plant is integrated in a old olive oil mill that was operational until the 1960s though its age dates back to the 1920s. The building has since been restored and provides visitors with a tasteful and combined experience of regional gastronomy. 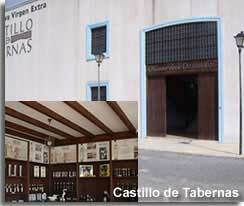 The museum presents the evolution of the olive oil production process in the Mediterranean with displays of the mechanisms used, the restaurant an opportunity to taste and sample local dishes where olives and olive oil are the distinguished ingredient, and the deli offers a chance to purchase from the Oro del Desierto collection. LOCATED: By the side of the N-340a highway at km 474. OPENING TIMES: Every day except Thurday, 9am - 6pm. This farm, one of the largest international producers of extra virgin olive oil, covers an area of approximately 470 acres and has more than 90,000 olive trees. 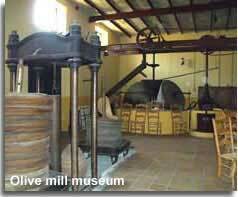 The mill offers cultural guided tours and an insight into the olive oil production process, allowing visitors to see for themselves the different stages in the development of the oil and preparation of the olive when it comes to the mill. 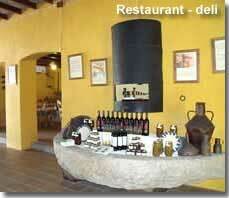 Naturally the Castillo de Tabernas olive oil is available for purchase. LOCATED: By the side of and signposted along the N-340a highway approximately 10km from Tabernas village, in the direction of Sorbas. OPENING TIMES: Every day except Sunday, 9am till 2pm. El Oro del Desierto website, with further information of the organic farming methods used for the production of the eco friendly olive oil, the website is detailed in English. Castillo de Tabernas website with product information and online shop, the website is detailed in Spanish with the option to change the language to English. Castillo de Tabernas guided tour the website is detailed in Spanish with the option to change the language to English. One of the least known deserts of the world, yet it has been seen by millions of people, albeit unknowingly. It has been used as a film location in many well known movies, such as the Clint Eastwood spaghetti westerns, Indiana Jones and the Last Crusade, Conan the Barbarian, Cleopatra and Lawrence Of Arabia. 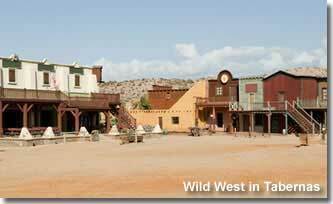 The cinematic history of Almeria is celebrated in a collection of wild west tourist attractions which are located in the desert and are collectively known as Mini Hollywood, the once humble film studios have now grown into extremely popular family tourist attractions. 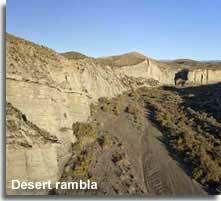 The desert ramblas and ravines can be appreciated by guided trips, either on foot, cycle, horseback, 4x4, or even by camel. Many of these excursions include the cinema locations. Malcaminos, a specialist tour guide in the area, provides several route options within the desert which are all detailed on their website, the tours are available in English. Movie location tours from Malcaminos. Themed desert routes - highlighting movie locations with plenty of information about the desert environment, and its flora and fauna. Hiking - Horse riding - Camel treks advertised by Malcaminos. Alternative tour options - including desert trails that provide information about the geological characteristics, history and flora and fauna of the desert. For the independent explorer there are signposted walking trails available, though it must be emphasised that venturing outside of these routes is not recommended. 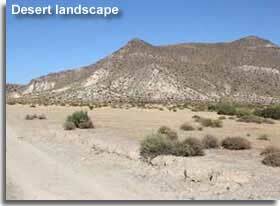 Of equal importance, please note that vehicles are not permitted into the desert interior. Explore the desert landscapes on foot, on one of the regions signposted walking trails. Take a guided drive through a world of cinema and visit the locations where great movie directors and actors have filmed their movie scenes, Sergio Leone, Orson Welles, Steven Spielberg, Clint Eastwood, Brigitte Bardot, Peter O’Toole, Richard Burton, Henry Fonda .... to name but a few. Over half of the feature films that have been registered in the province of Almeria have developed part of their scenes in the Tabernas desert and the surrounding Filabres-Alhamilla region, where the variety of landscapes include desert ravines, the heights of Sierra de Alhamilla and the typical towns of Sierra de los Filabres. Malcaminos tours, a specialist in the area, have provided a fully documented driving route, Ruta Principal Tabernas-Polopos, specifically targeting the filming spots of the region. Promoted by MANCOMUNIDAD, the Commonwealth of Municipalities for the Development of Interior Towns Sierra Alhamilla - Filabres, their website links to a PDF file, in English, which details the Malcamino route, with photos and movie locations. 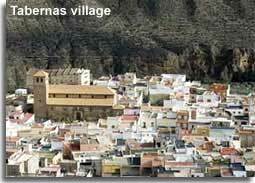 Villages : Tabernas - Castro de Filabres - Velefique - Senes - Tahal - Alcudia de Monteagud - Benitagla - Benizalon - Uleila del Campo - Lucainena de las Torres - Polopos - Puntal de Polopos. Starting point :Tabernas village main square.